SINGAPORE - Following a port visit in Muara, Brunei, and routine operations in the Sulu Sea and South China Sea, littoral combat ship USS Coronado (LCS 4) pulled pierside at Changi Naval Base in Singapore Feb. 25. After completing the four-day port visit in Brunei, Coronado conducted a passing exercise and visit, board, search and seizure (VBSS) training at sea with the Royal Brunei Navy (RBN) patrol vessel Daruttaqwa in the South China Sea. The ship then transited through the Balabac Strait and into the Sulu Sea for routine operations before heading back to port in Singapore. 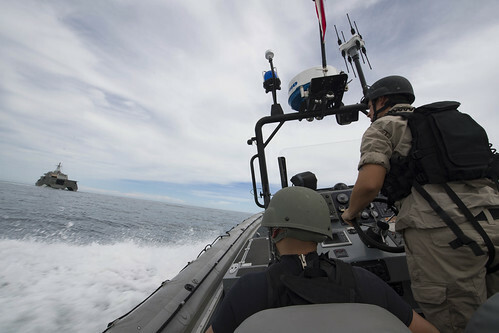 Training at sea with a regional partner for the first time while deployed to U.S. Seventh Fleet provided unique opportunities for the crew. Lt. j.g. Anthony Grayson, officer-in-charge, Surface Warfare Det. 2, talked about the importance of the VBSS training. “Working with the RBN gave the Coronado boarding team a chance to practice our skills onboard a vessel unfamiliar to our team,” said Grayson. “We were able to conduct a realistic scenario while training alongside a trusted partner, raising the readiness of both participating groups by sharing methods and tactics.” Once operations with the RBN were complete, the Coronado crew maintained a full schedule of unit-level training, including a crew served weapons exercise, damage control and man overboard drills, small boat and flight operations, and engineering operational checks. The port visit to Brunei included multiple ship tours and a static display of the embarked MH-60S Seahawk helicopter and MQ-8B Fire Scouts for the Royal Brunei Air Force. Coronado sailors also participated in a sports day with RBN counterparts, competing in a soccer game and tug-of-war match at the Naval Training Center in Muara, Brunei. Currently on a rotational deployment in U.S. 7th Fleet, Coronado is a fast and agile warship tailor-made to patrol the region’s littorals and work hull-to-hull with partner navies, providing 7th Fleet with the flexible capabilities it needs now and in the future. On behalf of Commander, Task Force 73, Destroyer Squadron 7 serves as operational commander for littoral combat ships rotationally deployed to 7th Fleet, and conducts advanced planning, organizes resources, and directly supports the execution of maritime engagements such as the Cooperation Afloat Readiness and Training (CARAT) exercise series, the Naval Engagement Activity (NEA) with Vietnam, and the multilateral Southeast Asia Cooperation and Training (SEACAT) exercise with Bangladesh, Cambodia, Brunei, Indonesia, Malaysia, the Philippines, Singapore, and Thailand.